A new standard IFRS 16 Leases, (originally issued in 2016 by the IASB to replace IAS 17 Leases), will become mandatory for annual periods beginning on or after 1 January 2019. Aiming to bring more transparency to leases in companies’ financial statements, the new standard will not only impact finance and accounting but will also result in major changes in data processing and related processes. Lessors are likely to be least affected by the changes. 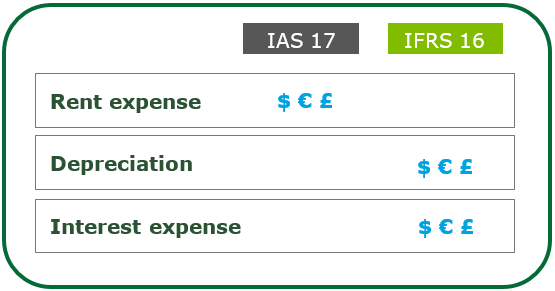 IFRS 16 Leases is very similar to IAS 17 Leases, introducing changes for subleases, lease modifications and disclosures only. Lessees, on the other hand, are likely to be the most affected, especially those that currently finance significant parts of their activities through operating leases. Accounting for contracts such as operating leases will no longer be applicable, except for short-term leases (terms of 12 months or less) and low-value asset leases. All other leases within the scope of IFRS 16 are required to be brought on-balance sheet by the lessees recognizing the ‘right-of-use’ of the asset and the related lease liability at commencement of the lease. 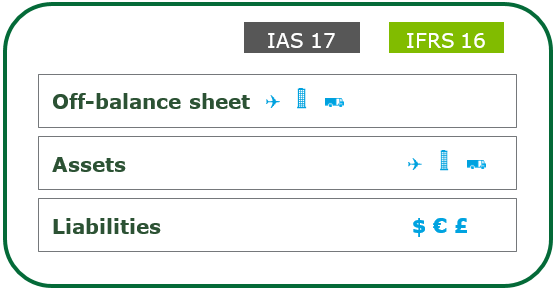 Subsequent accounting will generally be similar to the finance lease model under IAS 17. With respect to the financial impact, the new standard will firstly affect the balance sheet; it will lead to an increase in assets that are capitalized as well as in loans that are booked as liabilities. Secondly, it will affect the income statement, as lease expenses will be replaced by higher depreciation charges and an interest expense. Operating leases currently kept off-balance sheet should now be disclosed on the balance sheet thereby increasing total assets and liabilities. Rent expenses relating to the operating lease should be split into depreciation and interest payments. It will decrease operating expenses and respectively increase EBITDA of the lessee. Initial analysis of all contracts in order to establish how much and what type of data will have to be processed. Making new estimates depending on the nature and term of a lease, which could affect the reliability of financial forecasts. Initial recognition and classification: recognition of the lease liability and a right-of-use asset at the commencement date using the present value of the lease payments that are not paid at that date. Subsequent measurement and re-measurement: calculation of increase of carrying amount by interest component, increase / decrease by re-measurement component, etc. Identification of lease modifications: depending on the criteria met, accounting of lease modification as a separate lease, derecognition and recognition of a new lease or change in the carrying amount of an existing lease contract. Retrospective: Comparatives are re-calculated under the assumption that IFRS 16 has always been applied since the first day of the operating lease. Cumulative catch-up: Comparatives are presented as previously reported under IAS 17 with the difference in assets to liabilities recognised in operating retained earnings. Challenges for information systems and data management. The IFRS 16 standard by its very nature obliges companies to apply greater discipline in the management of leases and processing of data resulting from the contracts in their information systems. Deloitte offers an IFRS 16 solution within a modern, enterprise-class Finevare regulatory reporting suite.